Skin Effect describes the phenomena of alternating current flowing more densely near the surface of a conductor. The net effect is a reduction in effective area and an increase in the resistance. To calculate skin effect in tubular conductors made of solid wire to an infinitely thin tube, the curves of Ewan are used. The table below gives the factors for skin effect ratio R/R0 as a function of X, where R is the AC resistance and R0 is the DC resistance. Note that from the table, R/R0 is the resistance ratio due to skin effect. L/L0 is the inductance ratio due to skin effect. X is as defined by the formula above. For conductors larger than 1,500,000 circular mils,other calculation formulas must be used for accuracy. The non-uniform cross-sectional distribution of current also affects the inductance, the value of which is less than if the current density were uniform. 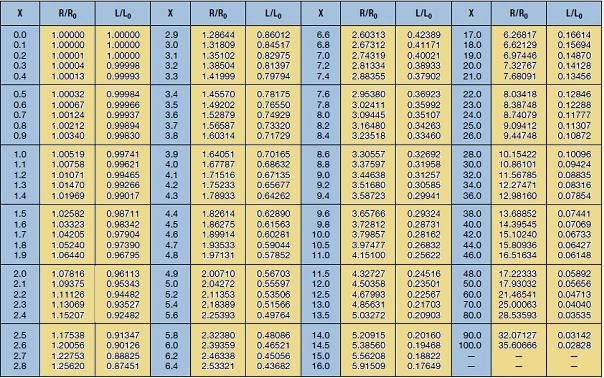 The table of skin effect ratios above, therefore, lists the inductance ratio L/L0 where L is the inductance due to a non-uniform current density and L0 is the inductance assuming uniform current density.